KATHMANDU, Jan 20: Nepal Stock Exchange (Nepse) benchmark index plunged 24.58 points to close at 1,406.52 points on Wednesday, the last trading day of the week. As there were two holidays in the week -- Maaghi festival on Monday and Sonam Lhosar on Thursday -- Nepse remained opened only for three trading days. 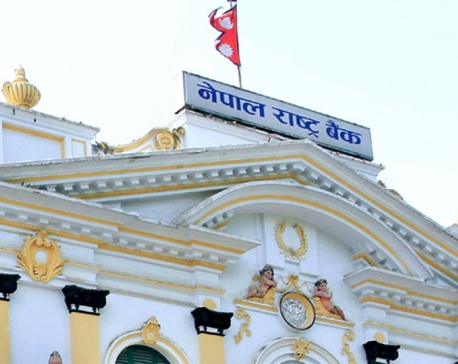 Analysts say that the rising interest rates of bank and financial institutions (BFIs) due to shortage of lendable fund have sent stocks downward. The market is now short of seven points to fall below 1,300 points -- first time since March last year. Though the stocks recovered to some extent in last three weeks, they started retreating again amid possibility of the crisis of lendable fund worsening instead of getting eased. Rather than buying shares in the downward market, many investors are tempted to deposit their money in BFIs who are offering as high as 13 percent interest rates on fixed deposit. While the rise in interest rates has driven down market, investors are also worried about the rising tensions across the country with the government decision to fix the 'temporary capitals' of seven provinces. "Since there is political uncertainty surrounding the implementation of federalism, investors have become worried due to the tensions triggered by the decision of fixing temporary capital," said a broker. The broker also said that rise in the supply of shares due to listing of rights and bonus shares of many companies was the reason behind the market slowdown. "While many companies have already announced dividend, investors have either sold what they held or are not buying new shares," the broker added. All trading groups registered loss this week. Hydropower was the biggest loser of the week as its sub-index fell 115.25 points to close at 1,864.23 points. Insurance group followed the suit. Its sub-index shed 89.4 points and ended at 7,270.44 points. Sub-indices of Development Bank and 'Others' group went down, respectively, closing at 1,570.85 points and 766.83 points. Banking, the heavyweight group, also tumbled 19.47 points to settle at 1,216.68 points. Microfinance group ended 13.69 points lower at 1,701.98 points. Hotels group also went down 13.08 points to close at 2,113.51 points. Finance and Manufacturing and processing groups ended 6.86 points and 5.75 points lower at 719.12 points and 2,452.54 points. 'Trading' group registered a loss of 2.87 points and finished at 189.53 points. 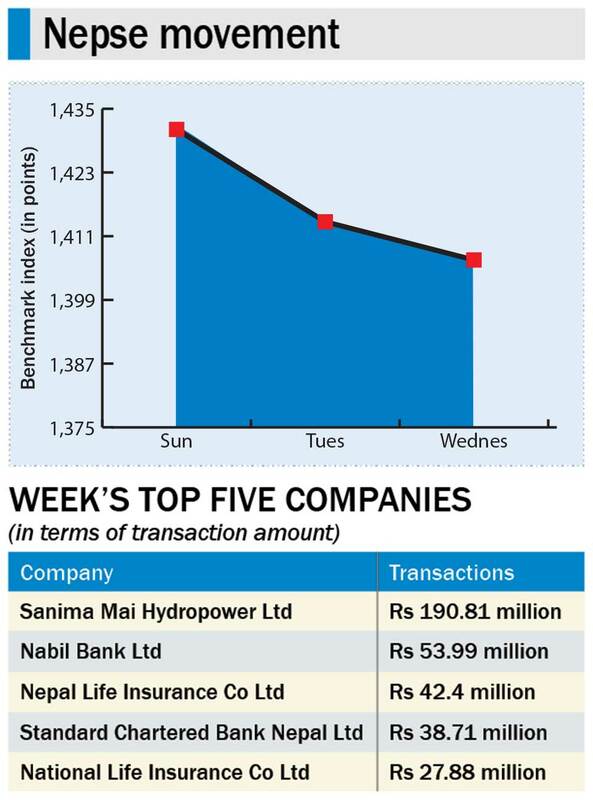 Sanima Mai Hydropower Ltd topped the list of companies in terms of turnover (Rs 190.8 million), traded shares (447,000 units) and number of transactions (1,184). A total of 2.46 million units of shares of 170 companies worth Rs 1.95 billion were traded in the market this week through 12,728 transactions. The turnover was 35.98 percent low than the last week.